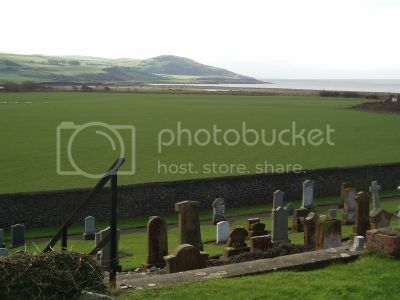 Ballantrae Old Graveyard lies in the village of Ballantrae next to the A77. Grid Reference NX 083 824. Contains 8 CWGC burials, 1 unidentified. 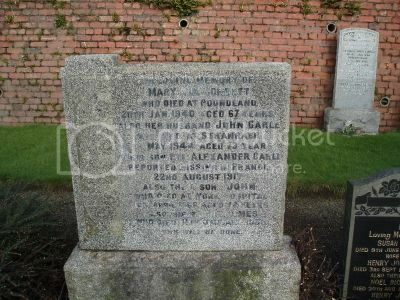 A joint grave funded by local subscription. Interestingly the first of those listed below was a casualty from HMS Godetia yet this grave is flanked by two official CWGC granite headstones of other Godetia casualties. Additional information: Husband of Mary Elizabeth Trengove of 13 Lan St. Morriston, Swansea. Buried in joint grave with Ldg Smn Hanlan. SS Ravensworth sank on 15/9/1917 in a collision with SS Eveleen off the Copeland while in passage from Cardiff to Norway with a cargo of coal. Regiment/Service: Royal Naval Reserve. HMS Transylvania. HMS Transylvania was a British liner converted into an armed merchant cruiser. She was torpedoed off Malin Head and, despite being taken in tow, she foundered with the loss of 36 lives. 300 people were rescued. (Source: Wikipedia). 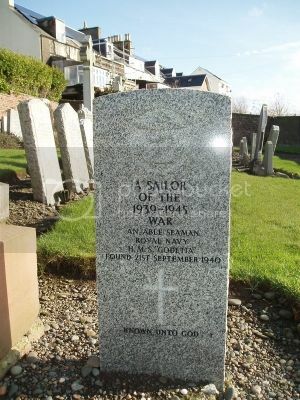 Additional information: Son of David and Ellen Hanlan; husband of Lillie Jane Hanlan, of 18, Cross St., Holyhead. Born at Belfast. (In the same grave are buried:-Fireman M. C. Livingston, S.S. "Rowan," Mercantile Marine. 19th Oct., 1921, and Engr. George Henry Trengove, S.S. "Ravensworth," Mercantile Marine. 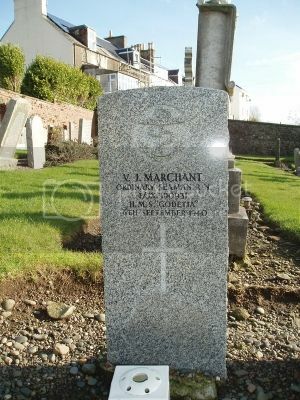 Drowned through collision at sea 15th Sept., 1917. 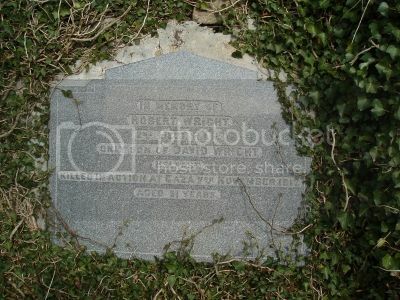 Age 58; husband of Mary Elizabeth Trengove, of 1, Lan St., Morriston, Swansea). 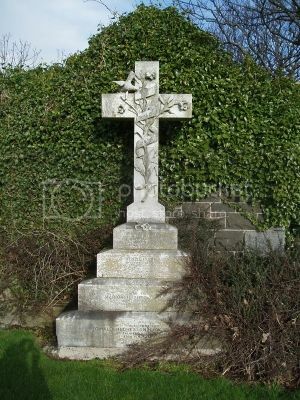 Information about David Hanlan and his death on SS Ravensworth can be found at: https://sites.google.com/site/holyheadwarmemorial19141918/home/navy/david-hanlan. 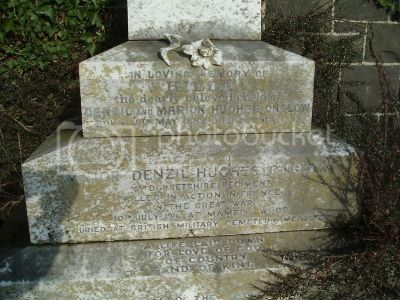 He is named on Holyhead War Memorial. The Wigtownshire Free Press (13/10/1921) reported on the sinking of the SS Rowan in a triple collision of Corsewall Point. The Rowan, a Laird Line liner, was bound for Dublin from Glasgow when she hit thick fog. Her stern was clipped by the American cargo steamer West Carnak, inward bound from San Francisco. Though not severely damaged she sent out a distress call and mustered passengers on deck. The Clan Liner Clan Malcolm, following the Rowan out of Glasgow, responded to the call but struck the Rowan midships causing her to founder with the loss of 22 lives. A British Pathe film of the time shows survivors arriving at Dublin http://www.britishpathe.com/video/s-s-ss-rowan-survivors. Regiment/Service: Royal Navy. HMS Godetia. An Able Seaman from HMS Godetia. 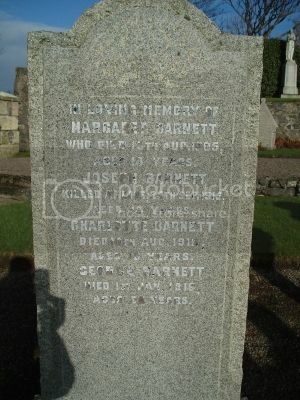 Additional information: Son of Peter and Hughine Barnett, of Ballantrae, Ayrshire. 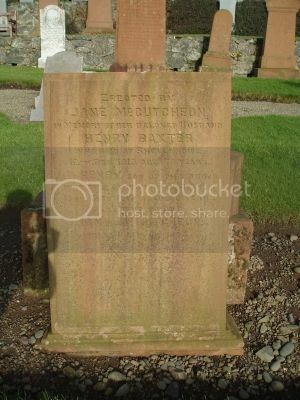 Additional information: Son of Henry and Jane Baxter, of Shellknowe, Ballantrae, Ayrshire. Wigtownshire Free Press (25/10/1917): Mrs Baxter, Shellknowe, received intimation that her only son, Pte Harry Baxter, Royal Scots, was killed in France on the 13th inst. The nurse who sent the news said that he had been severely wounded in battle and had died in hospital a few hours afterwards. Pte Baxter, who was 20 years of age, joined the Ayrshire Yeomanry in May 1916, and was transferred some time ago to the Royal Scots, and sent to France last June. Before he became a soldier he worked on his mother's croft. Since the outbreak of war eighteen men from Shellknowe have joined HM Forces. Three have been killed, and one is missing. 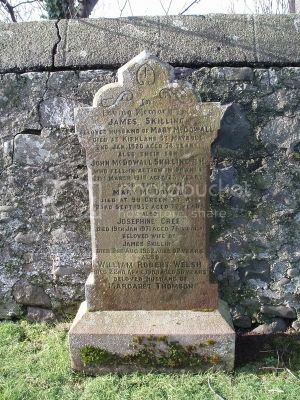 Additional information: Son of John and Mary Carle, of Shellknowe, Ballantrae, Ayrshire. Wigtownshire Free Press (4/10/1917): Mrs Carle, Shellknowe, has received official notice that her son, Pte Alex Carle, was posted as wounded and missing on August 22. Pte Carle's father and two brothers are serving in the Army. The father enlisted in August 1914. Wigtownshire Free Press (25/7/1918): Mrs Carle, Shellknowe, Ballantrae, has been officially informed that her son, Pte Alexander Carle, RSF, who has been missing since 22 August 1917, is now believed to be dead. Private Carle joined the Army in February 1917 and went to France in May. He was 19 years of age. Mrs Carle's husband is in France. Her eldest son is in Egypt and her second son is in hospital in this country. 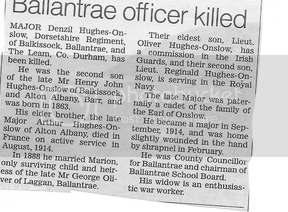 Additional information: Son of the late Henry John and Judith C. Hughes Onslow, of Balkissock, Ayrshire; husband of Marion Hughes-Onslow, of Laggan, Ballantrae, Ayrshire,. 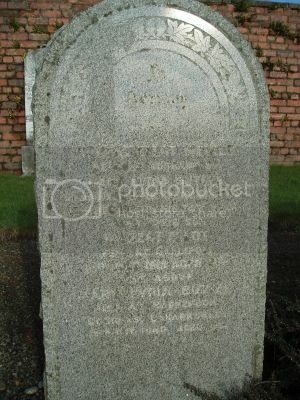 Additional information: Son of Robert and Mary Meikle, of Ballantrae, Ayr. Wigtownshire Free Press (%/8/1915): Pte Gilbert Meikle, 1st/5th Battalion, Royal Scots Fusiliers, was killed instantaneously on 12th July in the fight at the Dardanelles by a bullet wound in the neck. 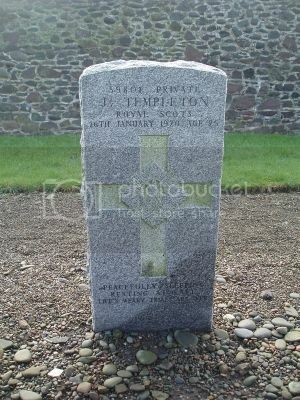 Meikle was born in Ballantrae parish 22 years ago and at the time of enlistment was a gardener at Pinmore House. The Commanding Officer (Captain Pollok-McCall), in a letter to the soldier's parents (mr and Mrs Meikle, Crailoch, Ballantrae) speaks of their son as a fine, gallant fellow, in whom he took a great interest. Pte Meikle is listed on the Barrhill Roll of Honour as published in the Wigtownshire Free Press of 16/12/1915. 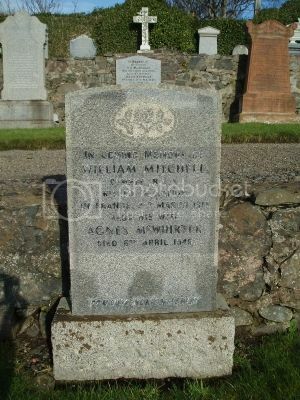 Additional information: Husband of Agnes Mitchell, of Ballochdowan, Ballantrae, Ayrshire. 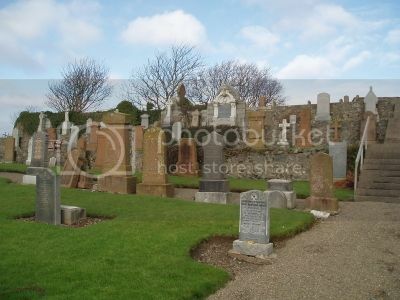 Additional information: Son of John and Agnes Skilling, of Heronsford, Ballantrae, Ayrshire. Also his brother James who won the Military Medal. Wigtownshire Free Press (24/8/1916): Intimation has been received by Mr and Mrs John Skilling, Heronsford, that their son, Hugh, was killed in action in France on 9 August last, and that their son, James, in the same regiment viz 6/7th RSF, has been wounded and is now in hospital in Aberdeen. 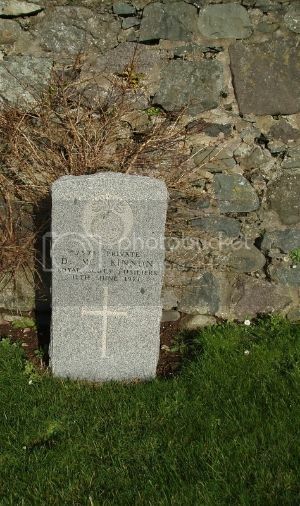 Private Hugh Skilling was employed by Mr Muir, contractor, Kilmarnock, in building operations at Laggan prior to enlisting at the outbreak of war and was one of the first volunteer contingent that left Ballantrae at the call of King and country two years ago. His parents have been employed on Laggan Estate for the last twenty-three years. Great sympathy is felt throughout the whole neighbourhood for Mr and Mrs Skilling in their heavy loss and anxiety. In a letter to Mr and Mrs Skilling the Captain commanding A Coy, 6/7th RSF, in the field, under date 16th August, writes - "I am very sorry to say that your son, Hugh, was killed in action yesterday (August 9th). We were being heavily shelled at the time, and one of the shells got the trench where your son was. I cannot tell you how sorry we all are to lose him, as he was one of the best men in the Company, and probably the best bomber we had. He came to France with me in May 1915 and he has died in one of the greatest battles in history. You have our deepest sympathy. Your son James is keeping quite well, though, of course, he feels the loss of his brother badly. You will miss Hugh dreadfully, as he must have been a good son. He was certainly a splendid soldier. All the officers wish to express their regret at your loss." 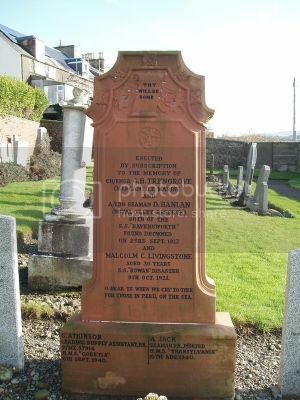 Additional information: Son of Mary Skilling of 99 Green St, Ayr, and the late James Skilling. Wigtownshire Free Press (4/1/1917): Private John Skilling, Auchencrosh, was admitted to hospital in France on 4th November suffering from nephritis and is now in hospital in Cardiff. He joined the Army in September 1914, and went to France in August 1916. His brother, James Skilling, was also recently admitted to hospital in France, and is now convalescent. He joined the Army in November 1914 and went to France in April 1915. Both lads were gardeners before they became soldiers. Wigtownshire Free Press (25/4/1918): Mr and Mrs Skilling, Auchencrosh, have received official intimation that their youngest son, Pte John Skilling, Black Watch, has been missing since 21 March. Pte Skilling, who was a gardener at St Leonard's, Dunfermline, when war broke out, enlisted in September 1914, and went to France in 1916. His brother, Pte James Skilling, Royal Scots, is suffering from a gunshot wound in the left arm, and from measles, and is in hospital in France. Prior to the war he was a gardener at the Tweed Vineyards, Clovenford, Galashiels. He enlisted in November 1914, and went to France in April 1915. 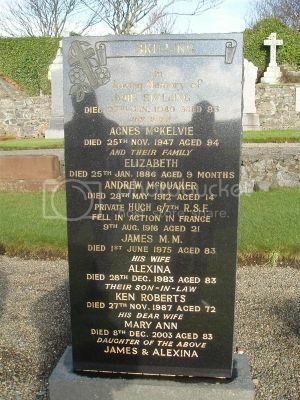 Additional information: Only son of David and Marion Dunlop Wright, of The Moat, Dundonald, Belfast. Born at Downan, Ballantrae, Ayrshire.